Emitter: The Strada uses two Cree XPG R5 LEDs. The Cree XPG R5 is a more refined, higher quality LED of the same type used in the 2011 range. It keeps the same great beam patterns and colour temperature but the light has an additional 7-10% output over last year’s models. We are quoting 325 lumens per LED rather than the 300 in 2011. Collimated Lens Technology: Exposure Lights use collimated Lens technology. These high-tech resin lenses are specifically designed to optimise light collection from each LED. A great deal of time is invested in research to ensure the optimal beam and output is achieved. Weatherproof Body: CNC machined aerospace grade aluminum body with efficient heat transfer design. Function button: Mode and Fuel Gauge indicator. New patented technology combats the loss in efficiency of LEDs at elevated temperatures, maintaining optimum output keeping you shining ‘Brighter for Longer’. Patented technology that enables a wide range of accessories to run from the power of the light. The charge port is now gold plated for more efficient conductivity and it is sealed to a greater level. The Smart Port now has a silicone cover to stop muddy gloves pushing dirt into the port. 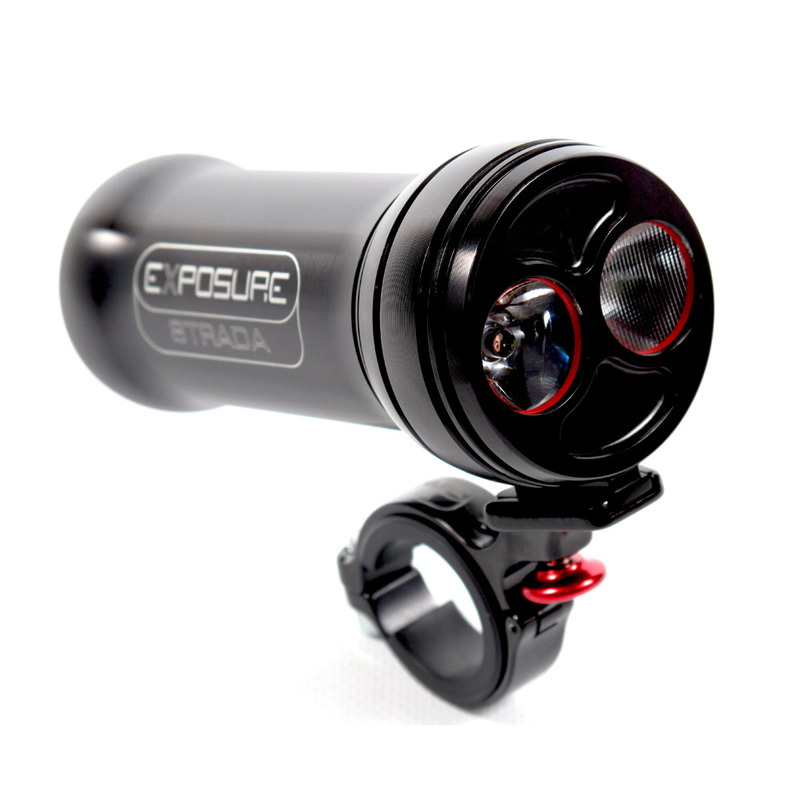 Includes: Quick Release handlebar bracket, Remote Switch and USB compatible charger.